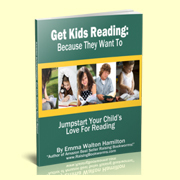 This guide was written by Emma Walton Hamilton, bestselling author of numerous books including “Raising Bookworms: Get Your Kids Reading for Pleasure and Empowerment”. Emma is passionate about helping parents raise children who love to read and her strategies have been proven to work over and over again. * WHY is it so important that we raise our kids to be readers?